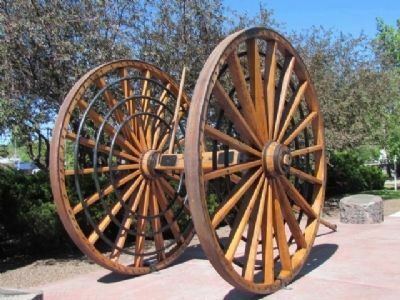 Logging wheels were originally an integral part of the early lumber industry in Northern Arizona. Originally designed in 1870 by Silas Overpack, a Manistee, Michigan wheelwright, the wheels were used by a local farmer to help him clear his land. When logging operations began in the early 1880's, they became a vital part of the process. The wheels, originally pulled by horses, were used into the early 1900's and were even pulled by early steam tractors. When lumberjacks felled the large trees and cut them into manageable lengths, the wheels were backed over the logs and the horses were disconnected. The tongue of the wheels was then lifted into the air and a chain was run under the logs and up to hooks on top of the axle. As the axle was pulled back down, it lifted the logs off the ground. A chain was then run around the front of the logs and the tongue to prevent the tongue from flipping back up. The horses were then re-harnessed to the wheels and the logs were pulled out of the woods to the railhead. Marker is on petrified log just to the right of the tongue. and Timber Company, as an entryway to Flagstaff. 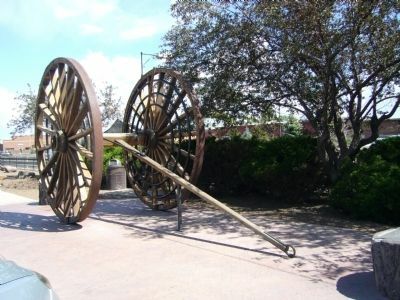 In the 1990's, these wheels were in a serious state of decay and were moved to the Arizona Historical Society-Pioneer Museum. In 2003, a restoration project was begun to restore them to their original condition. Few craftsmen remain that have the ability to work on wheels of this size. 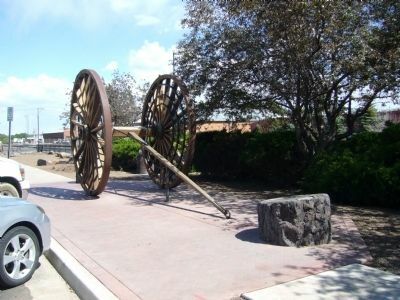 The wheels were disassembled and the hardware was sent to Hansen Wheel and Wagon Company of Letcher, South Dakota. The wood was irreparable. Hansen's craftsmen were able to use measurements and photos of the wheels to reconstruct this set, using the original iron parts. Location. 35° 11.859′ N, 111° 39.012′ W. Marker is in Flagstaff, Arizona, in Coconino County. Marker can be reached from the intersection of Route 66 and South Beaver Street. Touch for map. Marker is in the parking lot on the southeast corner, on the right when entering from Beaver Street. Marker is in this post office area: Flagstaff AZ 86001, United States of America. Touch for directions. (about 300 feet away); Raymond Building (about 400 feet away); Telephone Exchange (about 400 feet away); Coconino Chop House (about 400 feet away). 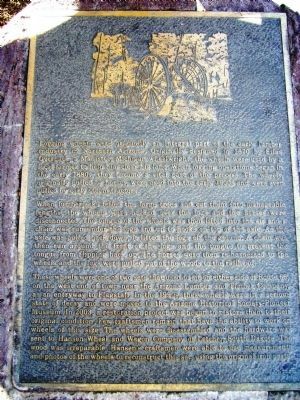 Touch for a list and map of all markers in Flagstaff. More. Search the internet for Logging Wheels. Credits. This page was last revised on June 16, 2016. This page originally submitted on July 20, 2010, by Bill Kirchner of Tucson, Arizona. This page has been viewed 1,122 times since then and 6 times this year. Photos: 1, 2, 3. submitted on July 20, 2010, by Bill Kirchner of Tucson, Arizona. 4. submitted on July 2, 2011, by Bob (peach) Weber of Prescott Valley, Arizona. • Syd Whittle was the editor who published this page.